This article is about the 17th and 18th century Puritan minister. For the rock band, see Cotton Mather (band). 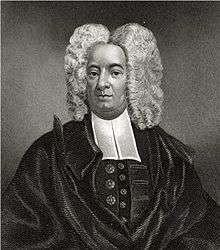 Cotton Mather, FRS (February 12, 1663 – February 13, 1728; A.B. 1678, Harvard College; A.M. 1681, honorary doctorate 1710, University of Glasgow) was a socially and politically influential New England Puritan minister, prolific author, and pamphleteer. He left a scientific legacy due to his hybridization experiments and his promotion of inoculation for disease prevention, though he is most frequently remembered today for his vigorous support for the Salem witch trials. He was subsequently denied the Presidency of Harvard College which his father Increase had held. Mather wrote more than 450 books and pamphlets, and his ubiquitous literary works made him one of the most influential religious leaders in America. He set the moral tone in the colonies, and sounded the call for second- and third-generation Puritans to return to the theological roots of Puritanism, whose parents had left England for the New England colonies of North America. The most important of these was Magnalia Christi Americana (1702) which comprises seven distinct books, many of which depict biographical and historical narratives. Mather was a highly influential force to be reckoned with in secular matters as well as spiritual. After the fall of James II of England in 1688, he was among the leaders of the successful revolt against James' governor of the consolidated Dominion of New England Sir Edmund Andros. A huge influence throughout Mather's career was Robert Boyle. Mather read The Usefulness of Experimental Natural Philosophy, which Boyle had written. Mather read Boyle's work closely throughout the 1680s and his early works on science and religion borrowed greatly from it. He used almost identical language to Boyle. Mather's relationship with his own father, Increase Mather, is thought by some to have been strained and difficult. Increase was a pastor of the North Square Church and president of Harvard College; he led an accomplished life. Despite Cotton's efforts, he never became quite as well known and successful in politics as his father. He did surpass his father's output as a writer, writing over 400 books. One of the most public displays of their strained relationship emerged during the witch trials, which Increase Mather reportedly did not support. Cotton Mather helped convince Elihu Yale to make a donation to a new college in New Haven that would come to be Yale College. Mr Cotton Mather, was the most active and forward of any Minister in the Country in those matters, taking home one of the Children, and managing such Intreagues with that Child, and after printing such an account of the whole, in his Memorable Providences, as conduced much to the kindling of those Flames, that in Sir Williams time threatened the devouring of this Country." They are answerable... more than almost any other men have been, for the opinions of their time. It was, indeed a superstitious age; but made much more so by their operations, influence, and writings, beginning with Increase Mather's movement, at the assembly of Ministers, in 1681, and ending with Cotton Mather's dealings with the Goodwin children, and the account thereof which he printed and circulated far and wide. For this reason, then in the first place, I hold those two men responsible for what is called 'Salem Witchcraft'"
"The time for a favor is come", exulted Cotton Mather; "Yea, the set time is come." 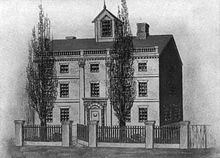 Mather claimed not to have attended the trials in Salem (although his father attended the trial of George Burroughs). Two contemporaries, Calef and Thomas Brattle, place him at the executions (see below). Mather began to publicize and celebrate the trials well before they were put to an end: "If in the midst of the many Dissatisfaction among us, the publication of these Trials may promote such a pious Thankfulness unto God, for Justice being so far executed among us, I shall Re-joyce that God is Glorified..." Mather called himself a historian not an advocate, but his writing largely presumes the guilt of the accused and includes such venomous comments as calling Martha Carrier "a rampant hag". Mather referred to George Burroughs—a Harvard alumnus, survivor of Indian attacks in Maine, and unordained minister hanged the same day as Martha Carrier, John Proctor, George Jacobs and John Willard—as a "very puny man" whose "tergiversations, contradictions, and falsehoods" made his testimony not "worth considering". Mather's most fatal influence over the trials was in composing the answer to the question of whether or not to allow spectral evidence, that is, allowing the afflicted girls to claim that some invisible ghost of the defendant was tormenting them, and for this to be considered evidence of witchcraft by the defendant, even if the defendant denied it and professed their own strongly held Christian beliefs. An opinion on the matter was sought from the most esteemed ministers of the area and Mather took credit for their response when anonymously celebrating himself years later: "drawn up at their desire, by Cotton Mather the younger, as I have been informed." On May 31, 1692, Mather wrote to one of the judges, John Richards, a member of his congregation, expressing his support of the prosecutions, but cautioning; "do not lay more stress on pure spectral evidence than it will bear ... It is very certain that the Devils have sometimes represented the Shapes of persons not only innocent, but also very virtuous. Though I believe that the just God then ordinarily provides a way for the speedy vindication of the persons thus abused." Hutchinson summarizes the letter, "The two first and the last sections of this advice took away the force of all the others, and the prosecutions went on with more vigor than before" (reprinting the letter years later in Magnalia, Mather notably omitted the fateful "two first and the last" sections). The original full version of the letter, called Return of the Several Ministers, was dated June 15, 1692, and had been reprinted in late 1692 in the final two pages of Increase Mather's Cases of Conscience. It is a curious document and remains a source of confusion and argument. Calef calls it "perfectly Ambidexter, giving as great as greater Encouragement to proceed in those dark methods, then cautions against them... indeed the Advice then given, looks most like a thing of his Composing, as carrying both Fire to increase and Water to quench the Conflagration." The S.G. [Salem Gentlemen] will by no means allow, that any are brought in guilty, and condemned, by virtue of spectre Evidence... but whether it is not purely by virtue of these spectre evidences, that these persons are found guilty, (considering what before has been said,) I leave you, and any man of sense, to judge and determine. The later rejection of spectral evidence by Governor Phips, whose wife, Lady Mary Phips, came under suspicion herself, and its exclusion from trials beginning in January 1693 immediately brought about far fewer convictions. Due to a reprieve by Phips, there were no further executions. Mr. Buroughs [sic] was carried in a Cart with others, through the streets of Salem, to Execution. When he was upon the Ladder, he made a speech for the clearing of his Innocency, with such Solemn and Serious Expressions as were to the Admiration of all present; his Prayer (which he concluded by repeating the Lord's Prayer) [as witches were not supposed to be able to recite] was so well worded, and uttered with such composedness as such fervency of spirit, as was very Affecting, and drew Tears from many, so that if seemed to some that the spectators would hinder the execution. The accusers said the black Man [Devil] stood and dictated to him. As soon as he was turned off [hung], Mr. Cotton Mather, being mounted upon a Horse, addressed himself to the People, partly to declare that he [Mr. Burroughs] was no ordained Minister, partly to possess the People of his guilt, saying that the devil often had been transformed into the Angel of Light. And this did somewhat appease the People, and the Executions went on; when he [Mr. Burroughs] was cut down, he was dragged by a Halter to a Hole, or Grave, between the Rocks, about two feet deep; his Shirt and Breeches being pulled off, and an old pair of Trousers of one Executed put on his lower parts: he was so put in, together with [John] Willard and [Martha] Carrier, that one of his Hands, and his Chin, and a Foot of one of them, was left uncovered. In the years after the trials, of the principal actors in the trial, whose lives are recorded after, neither he nor Stoughton ever admitted to any misgivings. In the years after the trials, he became an increasingly vehement defender of them. At the request of then Lt.-Gov. Stoughton, Mather wrote Wonders of the Invisible World during the trials, which were published in 1693.:67 The book contained a few of Mather's sermons, the conditions of the colony and a description of witch trials in Europe. :335 He somewhat clarified the contradictory advice he had given in Return of the Several Ministers, by defending the use of spectral evidence. Wonders of the Invisible World appeared at the same time as Increase Mather's Cases of Conscience." There are fourteen worthy ministers that have newly set their hands unto a book now in the press, containing Cases of Conscience about Witchcraft. I did, in my Conscience think, that as the humors of this people now run, such a discourse going alone would not only enable the witch-advocates, very learnedly to cavil and nibble at the late proceedings against the witches, considered in parcels, while things as they lay in bulk, with their whole dependencies, were not exposed; but also everlastingly stifle any further proceedings of justice & more than so produce a public & open contest with the judges who would (tho beyond the intention of the worthy author & subscribers) find themselves brought unto the bar before the rashest mobile [mob] — October 20, 1692 letter to his uncle John Cotton. The last event in Mather's involvement with witchcraft was his attempt to cure Mercy Short and Margaret Rule. Boston merchant Robert Calef began his eight-year campaign against the influential Mathers. Calef's book was inspired by the fear that Mather would succeed in once again stirring up new witchcraft trials, and the need to bear witness to the horrible experiences of 1692. He quotes the public apologies of the men on the jury and one of the judges. Upon reading Calef's More Wonders of the Invisible World, Increase Mather, Cotton's father, publicly burned the book in Harvard Yard. Poole was a librarian, and a lover of literature, including Mather's Magnalia "and other books and tracts, numbering nearly 400 [which] were never so prized by collectors as today." Poole announced his intention to redeem Mather's name, using as a springboard a harsh critique of a recently published tome by Charles Wentworth Upham, Salem Witchcraft Volumes I and II With an Account of Salem Village and a History of Opinions on Witchcraft and Kindred Subjects, which runs to almost 1,000 pages, and a quick search of the name Mather (referring to either father, son, or ancestors) shows that it occurs 96 times. Poole's critique, in book form, runs less than 70 pages but the name "Mather" occurs many more times than the other book, which is more than ten times as long. Upham shows a balanced and complicated view of Cotton Mather, such as this first mention: "One of Cotton Mather's most characteristic productions is the tribute to his venerated master. It flows from a heart warm with gratitude." Upham's book refers to Robert Calef no fewer than 25 times with the majority of these regarding documents compiled by Calef in the mid-1690s and stating: "Although zealously devoted to the work of exposing the enormities connected with the witchcraft prosecutions, there is no ground to dispute the veracity of Calef as to matters of fact." He goes on to say that Calef's collection of writings "gave a shock to Mather's influence, from which it never recovered." Calef produced only the one book; he is self-effacing and apologetic for his limitations, and on the title page he is listed not as author but "collector". Poole, champion of literature, cannot accept Calef whose "faculties, as indicated by his writings appear to us to have been of an inferior order;..." and his book "in our opinon, has a reputation much beyond its merits." Poole refers to Calef as Mather's "personal enemy" and opens a line, "Without discussing the character and motives of Calef..." but does not follow up on this suggestive comment to discuss any actual or purported motive or reason to impugn Calef. Upham responded to Poole in a book running five times as long and sharing the same title (referring to Poole as "the Reviewer.") Many of Poole's arguments were addressed, but both authors emphasize the importance of Cotton Mather's difficult and contradictory view on spectral evidence, as copied in the final pages, called "The Return of Several Ministers", of Increase Mather's "Cases of Conscience". 1892 Life and Times of Cotton Mather by Rev. Abijah P. Marvin, published by Congregational Sunday School and Publishing society. This work tends to paraphrase Cotton Mather’s artfully constructed diary. Marvin presents a lengthy critique of Robert Calef. 1925 Increase Mather, The Foremost American Puritan by Kenneth B. Murdock, Harvard University Press. Murdock studied under Wendall and is also critical of Cotton Mather, but in a strong desire to show Increase Mather in a positive light he omits much. 1940 Cotton Mather, A Bibliography by TJ Holmes, Harvard University Press. Holmes was Librarian at the William G. Mather Library. His notes are pugilistic and pro-Mather. But Holmes published, for the first time, Cotton Mather’s October 20, 1692 letter (see above) to his uncle opposing an end to the trials. 1971 The Admirable Cotton Mather by James Playsted Wood. A young adult book. In the preface, Wood writes that a “changed attitude” began with Wendall (above), and passed to Murdock (above) and another colleague in the Harvard English Department, Lyman Kittredge. The intricate relationship of the Mathers to Harvard, with a revisionist movement emerging from the same institution, can, at times, give an uncomfortable aspect of history being bent to team spirit. Chadwick Hansen's Witchcraft at Salem, published in 1969, defined Mather as a positive influence on the Salem Trials. Hansen considered Mather's handling of the Goodwin children to be sane and temperate. Hansen posited that Mather was more concerned with helping the affected children than witch-hunting. Mather treated the affected children through prayer and fasting. 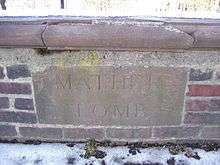 In 1688, Mather tried to convert Goodwife Glover, a Catholic, before she was executed, accused of practicing witchcraft on the Goodwin children. Hansen claimed Mather acted as a moderating influence in the trials by opposing the death penalty for those who confessed — or feigned confession — such as Tituba and Dorcas Good. Hansen claims that most negative impressions of Mather stem from his defense of the ongoing trials in Wonders of the Invisible World. After some others had lamented the roles they played in the executions and imprisonments, Mather and Stoughton remained the chief defenders of the trials, which diminishes the view of him as a moderate influence. The practice of smallpox inoculation (as opposed to the later practice of vaccination) was developed possibly in 8th-century India or 10th-century China. Spreading its reach in seventeenth-century Turkey, inoculation or, rather, variolation, involved infecting a person via a cut in the skin with exudate from a patient with a relatively mild case of smallpox (variola), to bring about a manageable and recoverable infection that would provide later immunity. 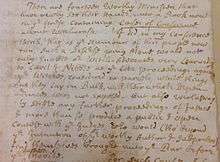 By the beginning of the 18th century, the Royal Society in England was discussing the practice of inoculation, and the smallpox epidemic in 1713 spurred further interest. It was not until 1721, however, that England recorded its first case of inoculation. Smallpox was a serious threat in colonial America, most devastating to Native Americans, but also to Anglo-American settlers. New England suffered smallpox epidemics in 1677, 1689–90, and 1702. It was highly contagious, and mortality could reach as high as 30 percent. Boston had been plagued by smallpox outbreaks in 1690 and 1702. During this era, public authorities in Massachusetts dealt with the threat primarily by means of quarantine. Incoming ships were quarantined in Boston harbor, and any smallpox patients in town were held under guard or in a "pesthouse". In 1706, Mather's slave, Onesimus, explained to Mather how he had been inoculated as a child in Africa. Mather was fascinated by the idea. By July 1716, he had read an endorsement of inoculation by Dr Emanuel Timonius of Constantinople in the Philosophical Transactions. Mather then declared, in a letter to Dr John Woodward of Gresham College in London, that he planned to press Boston's doctors to adopt the practice of inoculation should smallpox reach the colony again. On June 6, 1721, Mather sent an abstract of reports on inoculation by Timonius and Jacobus Pylarinus to local physicians, urging them to consult about the matter. He received no response. Next, Mather pleaded his case to Dr. Zabdiel Boylston, who tried the procedure on his only son and two slaves — one grown and one a boy. All recovered in about a week. Boylston inoculated seven more people by mid-July. The epidemic peaked in October 1721, with 411 deaths; by February 26, 1722, Boston was again free from smallpox. The total number of cases since April 1721 came to 5,889, with 844 deaths—more than three-quarters of all the deaths in Boston during 1721. Meanwhile, Boylston had inoculated 287 people, with six resulting deaths. Boylston and Mather's inoculation crusade "raised a horrid Clamour" among the people of Boston. Both Boylston and Mather were "Object[s] of their Fury; their furious Obloquies and Invectives", which Mather acknowledges in his diary. Boston's Selectmen, consulting a doctor who claimed that the practice caused many deaths and only spread the infection, forbade Boylston from performing it again. The New-England Courant published writers who opposed the practice. The editorial stance was that the Boston populace feared that inoculation spread, rather than prevented, the disease; however, some historians, notably H. W. Brands, have argued that this position was a result of the contrarian positions of editor-in-chief James Franklin (a brother of Benjamin Franklin). Public discourse ranged in tone from organized arguments by Reverend John Williams from Boston, who posted that "several arguments proving that inoculating the smallpox is not contained in the law of Physick, either natural or divine, and therefore unlawful", to those put forth in a pamphlet by Dr. William Douglass of Boston, entitled The Abuses and Scandals of Some Late Pamphlets in Favour of Inoculation of the Small Pox (1721), on the qualifications of inoculation's proponents. (Douglass was exceptional at the time for holding a medical degree from Europe.) At the extreme, in November 1721, someone hurled a lighted grenade into Mather's home. Several opponents of smallpox inoculation, among them Rev. John Williams, stated that there were only two laws of physick (medicine): sympathy and antipathy. In his estimation, inoculation was neither a sympathy toward a wound or a disease, or an antipathy toward one, but the creation of one. For this reason, its practice violated the natural laws of medicine, transforming health care practitioners into those who harm rather than heal. As with most colonists, Williams' Puritan beliefs were enmeshed in every aspect of his life, and he used the Bible to state his case. He quoted Matthew 9:12, when Jesus said: "It is not the healthy who need a doctor, but the sick." Dr. William Douglass proposed a more secular argument against inoculation, stressing the importance of reason over passion and urging the public to be pragmatic in their choices. In addition, he demanded that ministers leave the practice of medicine to physicians, and not meddle in areas where they lacked expertise. According to Douglass, smallpox inoculation was "a medical experiment of consequence," one not to be undertaken lightly. He believed that not all learned individuals were qualified to doctor others, and while ministers took on several roles in the early years of the colony, including that of caring for the sick, they were now expected to stay out of state and civil affairs. Douglass felt that inoculation caused more deaths than it prevented. The only reason Mather had had success in it, he said, was because Mather had used it on children, who are naturally more resilient. Douglass vowed to always speak out against "the wickedness of spreading infection". Speak out he did: "The battle between these two prestigious adversaries [Douglass and Mather] lasted far longer than the epidemic itself, and the literature accompanying the controversy was both vast and venomous." Generally, Puritan pastors favored the inoculation experiments. Increase Mather, Cotton's father, was joined by prominent pastors Benjamin Colman and William Cooper in openly propagating the use of inoculations. "One of the classic assumptions of the Puritan mind was that the will of God was to be discerned in nature as well as in revelation." Nevertheless, Williams questioned whether the smallpox "is not one of the strange works of God; and whether inoculation of it be not a fighting with the most High." He also asked his readers if the smallpox epidemic may have been given to them by God as "punishment for sin," and warned that attempting to shield themselves from God's fury (via inoculation), would only serve to "provoke him more". Puritans found meaning in affliction, and they did not yet know why God was showing them disfavor through smallpox. Not to address their errant ways before attempting a cure could set them back in their "errand". Many Puritans believed that creating a wound and inserting poison was doing violence and therefore was antithetical to the healing art. They grappled with adhering to the Ten Commandments, with being proper church members and good caring neighbors. The apparent contradiction between harming or murdering a neighbor through inoculation and the Sixth Commandment – "thou shalt not kill" — seemed insoluble and hence stood as one of the main objections against the procedure. Williams maintained that because the subject of inoculation could not be found in the Bible, it was not the will of God, and therefore "unlawful." He explained that inoculation violated The Golden Rule, because if one neighbor voluntarily infected another with disease, he was not doing unto others as he would have done to him. With the Bible as the Puritans' source for all decision-making, lack of scriptural evidence concerned many, and Williams vocally scorned Mather for not being able to reference an inoculation edict directly from the Bible. With the smallpox epidemic catching speed and racking up a staggering death toll, a solution to the crisis was becoming more urgently needed by the day. The use of quarantine and various other efforts, such as balancing the body's humors, did not slow the spread of the disease. As news rolled in from town to town and correspondence arrived from overseas, reports of horrific stories of suffering and loss due to smallpox stirred mass panic among the people. "By circa 1700, smallpox had become among the most devastating of epidemic diseases circulating in the Atlantic world." Mather strongly challenged the perception that inoculation was against the will of God and argued the procedure was not outside of Puritan principles. He wrote that "whether a Christian may not employ this Medicine (let the matter of it be what it will) and humbly give Thanks to God's good Providence in discovering of it to a miserable World; and humbly look up to His Good Providence (as we do in the use of any other Medicine) It may seem strange, that any wise Christian cannot answer it. And how strangely do Men that call themselves Physicians betray their Anatomy, and their Philosophy, as well as their Divinity in their invectives against this Practice?" The Puritan minister began to embrace the sentiment that smallpox was an inevitability for anyone, both the good and the wicked, yet God had provided them with the means to save themselves. Mather reported that, from his view, "none that have used it ever died of the Small Pox, tho at the same time, it were so malignant, that at least half the People died, that were infected With it in the Common way." 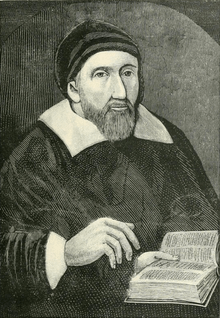 While Mather was experimenting with the procedure, prominent Puritan pastors Benjamin Colman and William Cooper expressed public and theological support for them. The practice of smallpox inoculation was eventually accepted by the general population due to first-hand experiences and personal relationships. Although many were initially wary of the concept, it was because people were able to witness the procedure's consistently positive results, within their own community of ordinary citizens, that it became widely utilized and supported. One important change in the practice after 1721 was regulated quarantine of innoculees. Although Mather and Boylston were able to demonstrate the efficacy of the practice, the debate over inoculation would continue even beyond the epidemic of 1721–22. After overcoming considerable difficulty and achieving notable success, Boylston traveled to London in 1725 where he published his results and was elected to the Royal Society in 1726 with Mather formally receiving the honor two years prior. When Mather died, he left behind an abundance of unfinished writings, including one entitled The Biblia Americana. Mather believed that Biblia Americana was the best thing he had ever written; his masterwork. Biblia Americana contained Mather's thoughts and opinions on the Bible and how he interpreted it. Biblia Americana is incredibly large, and Mather worked on it from 1693 until 1728, when he died. Mather tried to convince others that philosophy and science could work together with religion instead of against it. People did not have to choose one or the other. In Biblia Americana, Mather looked at the Bible through a scientific perspective, completely opposite to his perspective in The Christian Philosopher, in which he approached science in a religious manner. Mather's first published sermon, printed in 1686, concerned the execution of James Morgan, convicted of murder. Thirteen years later, Mather published the sermon in a compilation, along with other similar works, called Pillars of Salt. Magnalia Christi Americana, considered Mather's greatest work, was published in 1702, when he was 39. The book includes several biographies of saints and describes the process of the New England settlement. In this context "saints" does not refer to the canonized saints of the Catholic church, but to those Puritan divines about whom Mather is writing. It comprises seven total books, including Pietas in Patriam: The life of His Excellency Sir William Phips, originally published anonymously in London in 1697. Despite being one of Mather's best-known works, many have openly criticized it, labeling it as hard to follow and understand, and poorly paced and organized. However, other critics have praised Mather's work, citing it as one of the best efforts at properly documenting the establishment of America and growth of the people. In 1721, Mather published The Christian Philosopher, the first systematic book on science published in America. Mather attempted to show how Newtonian science and religion were in harmony. It was in part based on Robert Boyle's The Christian Virtuoso (1690). Mather reportedly took inspiration from Hayy ibn Yaqdhan, by the 12th-century Islamic philosopher Abu Bakr Ibn Tufail. Despite condemning the "Mahometans" as infidels, Mather viewed the novel's protagonist, Hayy, as a model for his ideal Christian philosopher and monotheistic scientist. Mather viewed Hayy as a noble savage and applied this in the context of attempting to understand the Native American Indians, in order to convert them to Puritan Christianity. Mather's short treatise on the Lord's Supper was later translated by his nephew Josiah Cotton. Mather, Cotton (2001) , A Family, Well-Ordered . 1 2 Sibley, John Langdon (1885). Biographical Sketches of Graduates of Harvard University in Cambridge, Massachusetts, Volume III. Cambridge: Charles William Sever, University Bookstore. ↑ Forty of Boston's historic houses, State Street Trust Co, 1912 . ↑ Hostetter, Margaret Kendrick (April 5, 2012). "What We Don't See". The New England Journal of Medicine. 366: 1328–34. doi:10.1056/NEJMra1111421. Retrieved April 6, 2012. ↑ Middlekauff, Robert (1999), The Mathers: Three Generations of Puritan Intellectuals, 1596–1728, Los Angeles, CA: University of California Press . ↑ Profile, Yale University, retrieved December 25, 2014 . ↑ Upham, Charles Wentworth (September 1869). "Salem Witchcraft and Cotton Mather". The Historical Magazine and Notes and Queries Concerning the Antiquities, History and Biography of America. Second. Vol. VI no. 3. Morrisania, NY: Henry B. Dawson. p. 140. Retrieved 2016-04-02. ↑ Bancroft 1874–1878, p. 83. ↑ Bancroft 1874–1878, p. 84. ↑ Stacy Schiff. "The Witches of Salem: Diabolical doings in a Puritan village", The New Yorker, September 7, 2015, pp. 46-55. ↑ Wonders of the Invisible World . ↑ Anonymous (1697), The Life of Sir William Phips, London, UK . ↑ Mather, Cotton (1971). Silverman, Kenneth, ed. Selected Letters. Baton Rouge, Louisiana: Louisiana State University Press. pp. 35–40. ISBN 0-8071-0920-7. ↑ Calef 1823, pp. 301-03. 1 2 Upham, Charles (1859), Salem Witchcraft, New York: Frederick Ungar, ISBN 0-548-15034-6 . ↑ Burr, George Lincoln. Narrative of Witchcraft Cases 1648–1706. University of Virginia Library: Electronic Text Center. 1 2 Bancroft 1874–1878, p. 85. ↑ Bancroft 1874–1878, p. 98. ↑ Levy, Babette (1979). Cotton Mather. Boston: Twayne. ISBN 0-8057-7261-8. ↑ Hansen 1969, p. 209. ↑ Breslaw 2000, p. 455. ↑ Holmes, Thomas James (1974), Cotton Mather: A Bibliography of His Works, Crofton . ↑ Lovelace 1979, p. 202. ↑ Lovelace 1979, p. 22. ↑ Poole, William Frederick (1869). Cotton Mather and Salem Witchcraft. Cambridge: University Press: Welch, Bigelow, & Co. p. 67. ↑ Mather, Witchcraft, University of Virginia . ↑ Hansen 1969, p. 168. ↑ Hansen 1969, p. 60. ↑ Hansen 1969, p. 24. ↑ Hansen 1969, pp. 23-24. ↑ Hansen 1969, p. 189. ↑ Gregg, Larry (1992). The Salem Witch Crisis. New York: Praeger. ↑ Demos, John (2004). Entertaining Satan: Witchcraft and the Culture of Early New England. Oxford, UK: Oxford University Press. ISBN 0-19-503131-8. ↑ Hopkins, Donald R. (2002). The Greatest Killer: Smallpox in History; ISBN 0-226-35168-8, p. 140. ↑ Needham, Joseph (2000), Part 6, Medicine, Science and Civilization in China, 6. Biology and Biological Technology, Cambridge, UK: Cambridge University Press, p. 154 . ↑ Gronim 2007, p. 248. ↑ Niven, Steven J. (2013). "Onesimus (fl. 1706–1717), slave and medical pioneer, was born in the...". Hutchins center. Harvard College. Retrieved September 21, 2015. ↑ Best, M (2007). "Making the right decision: Benjamin Franklin's son dies of smallpox in 1736". Qual Saf Health Care. 16 (6): 478–80. doi:10.1136/qshc.2007.023465. PMC 2653186 . PMID 18055894. ↑ Mather 1911–1912, pp. 11, 628. ↑ Blake 1952, p. 493. ↑ Blake 1952, p. 495. ↑ Niederhuber, Matthew (December 31, 2014). "The Fight Over Inoculation During the 1721 Boston Smallpox Epidemic". Harvard University. ↑ Williams 1721, p. 13. ↑ Douglass 1722, p. 11. ↑ Van de Wetering 1985, p. 46. ↑ Heimert, Alan, Religion and the American Mind, p. 5 . ↑ Williams 1721, p. 4. ↑ Mather 1721, p. 25, n. 15. ↑ Mather 1721, p. 2. ↑ Van de Wetering 1985, p. 66, n. 55. ↑ Hovey 2009, p. 533. ↑ Smolinski 2009, pp. 280–81. ↑ Mather, Cotton (2008). True Crime: An American Anthology. Library of America. ISBN 978-1-59853-031-5. Retrieved December 10, 2015. ↑ Meyers 2006, pp. 23–24. ↑ Halttunen 1978, p. 311. ↑ "Thanksgiving's Wampanoag call: Come Over and Help Us!". Josiah Cotton. To every tribe. Retrieved September 13, 2015. Aronson, Stanley M; Newman, Lucile (2002), God Have Mercy on This House: Being a Brief Chronicle of Smallpox in Colonial New England, Brown University News Service . Bancroft, George (1874–1878), History of the United States of America, from the discovery of the American continent, Boston: Little, Brown, & co, ISBN 0-665-61404-7 . Bercovitch, Sacvan (1972), "Cotton Mather", in Emerson, Everett, Major Writers of Early American Literature, Wisconsin: University of Wisconsin Press . Blake, John B (December 1952), "The Inoculation Controversy in Boston: 1721–1722", The New England Quarterly, 25 (4): 489–506, doi:10.2307/362582 . Calef, Robert (1700), More Wonders of the Invisible World, London, ENG, UK: Nath Hillar on London Bridge . Calef, Robert (1823), More Wonders of the Invisible World, Salem: John D. and T.C. Cushing, Jr.
Douglass, William (1722), The Abuses and Scandals of Some Late Pamphlets in Favor of Inoculation of the Small Pox, Boston: J. Franklin . Gronim, Sara Stidstone (2006), "Imagining Inoculation: Smallpox, the Body, and Social Relations of Healing in the Eighteenth Century", Bulletin of the History of Medicine, 80: 247–68, doi:10.1353/bhm.2006.0057 . Halttunen, Karen (1978), "Cotton Mather and the Meaning of Suffering in the Magnalia Christi Americana", Journal of American Studies, 12 (3): 311–29, doi:10.1017/s0021875800006460, JSTOR 27553427 . Hansen, Chadwick (1969), Witchcraft at Salem, New York: George Braziller, ISBN 0-451-61947-1 . Hovey, Kenneth Alan (2009), "Cotton Mather: 1663–1728", in Lauter, Paul, Heath Anthology of American Literature, A, Boston: Houghton Mifflin Harcourt, pp. 531–33 . Kennedy, Rick (2015), The First American Evangelical: A Short Life of Cotton Mather, Eerdmans , xiv, 162 pp. Lovelace, Richard F (1979), The American Pietism of Cotton Mather: Origins of American Evangelicalism, Grand Rapids, MC; Washington, DC: American University Press; Christian College Consortium, ISBN 0-8028-1750-5 . Mather, Cotton (1911–1912), Diary, Collections, vii–viii (vii), Massachusetts Historical Society . ——— (1995), Smolinski, Reiner, ed., The Threefold Paradise of Cotton Mather: An Edition of 'Triparadisus', Athens and London: University of Georgia Press, ISBN 0-8203-1519-2 . ——— (2010), Smolinski, Reiner, ed., Biblia Americana (edited, with an introduction and annotations), 1: Genesis, Grand Rapids and Tuebingen: Baker Academic and Mohr Siebeck, ISBN 978-0-8010-3900-3 . Meyers, Karen (2006), Colonialism and the Revolutionary Period (Beginning–1800): American Literature in its Historical, Cultural, and Social Contexts, New York: DWJ . Montagu, Mary Wortley (1763), Letters of the Right Honourable Lady M—y W—y M—e, London: T. Becket and P.A. de Hondt . Smolinski, Reiner (2006), "Authority and Interpretation: Cotton Mather's Response to the European Spinozists", in Williamson, Arthur; MacInnes, Allan, Shaping the Stuart World, 1603–1714: The Atlantic Connection, Leyden: Brill, pp. 175–203 . ——— (November 3, 2009) , "How to Go to Heaven, or How to Heaven Goes? Natural Science and Interpretation in Cotton Mather's Biblia Americana (1693–1728)", The New England Quarterly, Farmville, VA: MIT Press Journals, Longwood University Library, 81 (2): 278–329, doi:10.1162/tneq.2008.81.2.278 . Upham, Charles Wentworth (1959), Salem Witchcraft, New York: Frederick Ungar, ISBN 0-548-15034-6 . ——— (1869), Salem Witchcraft and Cotton Mather, A Reply, Morrisania, Bronx: Project Gutenberg . Van De Wetering, Maxine (March 1985), "A Reconsideration of the Inoculation Controversy", The New England Quarterly, 58 (1): 46–67, doi:10.2307/365262 . Wendell, Barrett (1891), Cotton Mather, the Puritan priest, New York: Dodd, Mead & co .
White, Andrew (2010), "Zabdiel Boylston and Innoculation", Today In Science History . Williams, John (1721), Several Arguments Proving that Inoculating the Smallpox is not Contained in the Law of Physick, Boston: J. Franklin . Winslow, Ola Elizabeth (1974), A Destroying Angel: The Conquest of Smallpox in Colonial Boston, Boston: Houghton Mifflin . Zirkle, Conway (1935), The beginnings of plant hybridization, Philadelphia: University of Pennsylvania Press . Wikimedia Commons has media related to Cotton Mather.